President Jefferson may have been surprised when Napoleon offered the whole of the Louisiana Territory for sale in 1803, but he was far from unprepared. In 1792, Jefferson had already started his quest to map and explore the lands west of St. Louis, and to find a water route to the Pacific. A few months before his envoy went to Paris to discuss Louisiana, Jefferson had quietly directed his private secretary to certain studies. 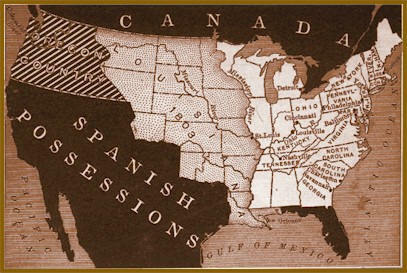 These included geography, navigation, and other subjects that would be needed on an exploration to the Pacific. Jefferson's private secretary was a man named Meriwether Lewis, a Virginian frontiersman and soldier. He had served in the army in Ohio with a former Army captain and friend, William Clark. These two men would work together as partners for President Jefferson. The two were to share joint command as they explored, mapped, and studied a new route to the Pacific. Lewis had copies of most of the available maps of the northwest, which included those of Captain Vancouver and Alexander Mackenzie. He had abundant supplies, equipment and trading goods ready. 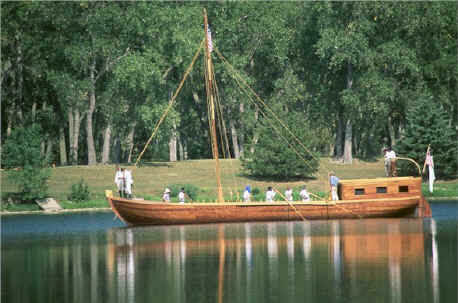 Boat builders were adapting a 55 foot Keelboat, which could be sailed, rowed, poled like a raft, or towed from the riverbank. In addition to the Keelboat, two wooden row boats called Pirogues were taken to hold men and supplies. In late 1803, Lewis and Clark took their men and their boats to Camp DuBois to spend the winter at the mouth of the Missouri. In the spring and after the formal transfer of Louisiana to the United States, Lewis remained in St. Louis to attend to diplomatic business while Clark took the party up river to St. Charles. On May 21, 1804 "The Corps of Discovery" set out on one of the most documented American adventures. By July, the Corps had traveled into Indian country, but had not met up with any Indians. 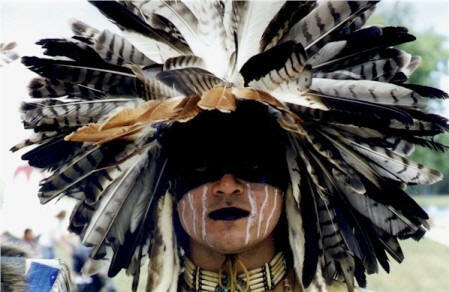 Then, during a halt a hunting party met up with a Missouri Indian. A few days later a company of Otoe and Missouri came to visit. Lewis spoke to the assemblage about the United States control of Louisiana and the need for peace between Indians and Americans. Lewis knew that he would soon run into the Sioux and they might not receive him so cordially. Lewis finally made contact with the Yankton Sioux at Calumet Bluff on August 30th. He saw little of the ferocity of the Sioux in this first meeting, and the expedition parted from the Yanktons' on the best of terms. For a while, the Corps spent some idyllic days hunting the abundant autumn game, while Lewis was happily engrossed with natural history. This mood was shattered by the keelboat's approach to another Sioux camp, which turned out to be far from peaceable. When Lewis tried to begin a council, the chiefs reacted with suspicion and belligerence. The Teton Sioux did not want a powerful force of white men so deep within their country. But again the explorers? combination of coolness and firepower kept the Indians from starting a fight. As a result, peace had been preserved, and the Corps of Discovery sailed on. Because the weather had turned cold, windy, and wet, a winter campsite was urgently needed. One was found near the Mandan Villages in present day North Dakota by the time of the first snow, and its construction was begun in November. A stout log fort called Fort Mandan was completed by December 24th, 1804, and the Corps settled in for the winter. While at Fort Mandan, Lewis made contact with fur traders, one of them was a French Trader Touissant Charbonneau that was married to a Shoshone girl named Sacagawea, who would later be helpful to the expedition. When spring freed the keelboat from river ice, Lewis sent it back east with some of the soldiers and many of the new discoveries. The narrowing river demanded smaller craft, and so the Corps made six canoes to supplement the two pirogues. 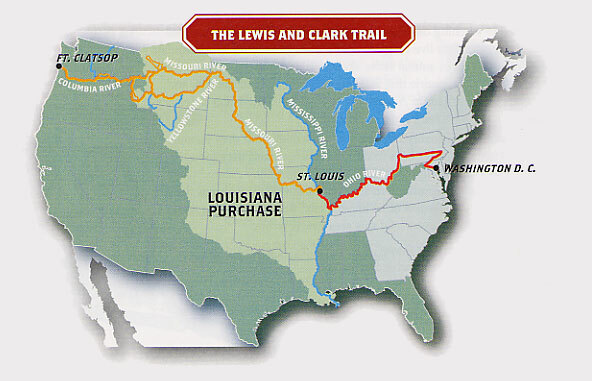 On April 7th, 1805, Lewis and Clark and the Corps of Discovery headed west. By late April they had reached the junction with the Yellowstone River, which was located in the rugged foothill country. This region held some animals which were strange to them, mountain sheep, mule deer, and grizzly bears. While bears were keeping the hunters busy, the Missouri was occupying the river men. They began a grueling portage around the 90 foot cascades of the Great Falls. The men made a crude wagon to carry the boats and supplies around the falls. They had to repair the wagon constantly, but finally in mid-July, the 18-mile detour was over, and the Corps went back on the river to force their way up into the Rocky Mountains. Lewis and Clark had been shocked to find that the Rockies were not a single wall of mountains. 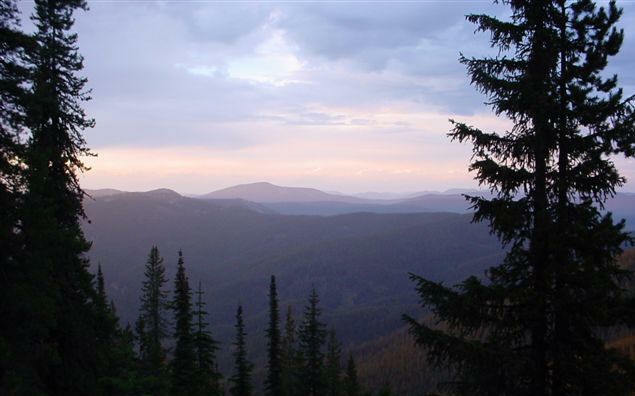 They still believed that the Columbia headwaters would be waiting for them after a short overland trek across the Continental or Great Divide. By July 25th, they had reached another expected landmark, the Missouri's Three Forks. Lewis and a few men left the party to forge ahead on land and look for the Shoshoni. They roamed the river valley for days while Clark and the others dragged the boats up the stream. Lewis knew the need for Indian help grew even more desperate. Without horses the "Corps of Discovery" would not be able to continue. The day after crossing the Divide, Lewis met a band of Shoshoni and sent for Clark and the rest of the company. When they arrived, it was discovered that the leader of the Shoshoni band was Sacagawea's brother. This family connection helped the Corps acquired horses, information and a guide. They cached their canoes and some equipment on the newly named Jefferson River, and then struggled off on heavily laden horses over underbrush choked mountain trails looking for navigable water. In September, they decided to turn north to the Bitterroot Valley in order to strike an Indian trail described by the Shoshoni. The trail was rocky and horses crippled themselves and some even fell off the slopes. The hunting was poor and the men hungry. They soon found before them lower, less rugged terrain, and a creek which they were sure would lead to the Columbia River. A headlong descent by the starving, weakened men brought them to a hospitable Nez Perce camp, where the Indians fed them with dried salmon. Here the weather was warmer and the game more plentiful. After they had been fed and had rested, the Corps began to travel again. Within a few days they had reached the Clearwater River, a tributary of the Snake which led to the Columbia. On October 16th, almost without warning the men found themselves on the broad waters of the Columbia, rushing toward the Pacific Ocean. When they reached the Narrows of the Columbia, Lewis saw the water "boiling and whirling in every direction" over jagged rocks, but the impatient Corps flung their canoes through the obstacles, without any damaging effects. A longer portage had to be made around the ferocious waters of the Cascades. By early November the Cascades were behind them; they had overcome the last mountain obstacle and were moving through tidewater. Ocean in View ~ O' the Joy! Within a few days, the river widened into a broad bay. The Corps thought (mistakenly) that they could see the Pacific. Clark wrote "Ocian in view! O, the joy! 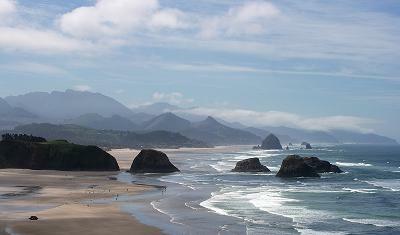 ", but that joy turned to misery when rough water and torrential rain drove them to camp under the bay?s sheer cliffs. After a few days they paddled into the Columbia's estuary, with the open sea spread before them. Later while a spot for a winter camp was being voted on, Clark carved on a tree: "William Clark, By land from the U. States in 1804 and 1805." Leaving Fort Clatsop, Oregon on March 23, 1806, the Corps of Discovery began their journey home. Having survived a winter of sickness, monotonous diet, and dreary weather, the impatient explorers departed after gifting Fort Clatsop to a Clatsop leader. It had been almost two years since they had left Wood River, Illinois in May of 1804. The explorers were backtracking across familiar terrain and their previous route, however they would alter their path after passing the great falls of the Columbia. Trading canoes for horses the explorers continued their journey by land to the Walla Walla (Walula) Indians. Camping among the tribe for two days, Chief Yelleppit informed them of an overland shortcut to the Nez Perce. This route took the party across present towns of Waitsburg, Dayton, and Pomeroy, Washington. Reaching the Snake River on May 4, they continued traveling up the north side of the river before settling into a camp on May 14, awaiting the snows to melt in the Bitterroot Mountains. Their campsite was called "Camp Chopunnish", a word Lewis used for the Nez Perce, located near Kamiah, Idaho. On June 10, they gathered their horses and proceeded on to Weippe Prairie. Four days later Lewis reported in his journal, "we have now been detained near five weeks in consequence of the snows; a serious loss of time at this delightfull season for traveling. Every body seems anxious to be in motion." The next morning they departed Weippe Prairie in an attempt to cross Lolo Trail. On June 17 the disappointed explorers returned to the Prairie and hired an Indian guide from their nearby campsite of "Chopunnish". On June 24 the party set out along with their three Nez Perce guides arriving at Traveler's Rest (near present Missoula, Montana) six days later. Reuniting on August 12, at Reunion Bay near New Town, North Dakota, days later Lewis and Clark bid farewell to Sacagawea, paid Toussaint Charbonneau for his services and turned their canoes south, arriving in St. Louis 37 days later.